Like DSLR cameras, still lenses were not designed for video, they were designed for still photography. This creates some problems, especially for experienced filmmakers but also for photographers entering into the realm of video. Most of these problems do not effect the quality of the image directly – Nikon, Canon and much third-party glass is well-known for its quality – but in usability. For example, it's a little more difficult to focus a still lens than a cinema lens. Some characteristics, like lens breathing, is built into the lens and can have distracting effects on your final images. On cinema lenses, minor focus adjustments can easily be made by turning the manual focus ring because it has a longer focus throw; you can turn the focus ring a lot further on a cinema lens. On still lenses, the focus throw is much shorter, meaning minor adjustments to the focus ring creates major adjustments in the focus of your image. Sometimes, people prefer more responsive mechanisms. Responsive brakes in a car, for example, are generally a good thing. So for some, this may not be a problem at all. However, it will generally be much more difficult to achieve accurate focus on a lens with a shorter focus throw if you are not accustomed to pulling focus at all. There is no way to control aperture manually on most modern still lenses. Filmmakers are accustomed to an iris ring on the lens that can be turned to adjust the lens aperture – this is missing on most modern still lenses. When a still lens does have an iris ring, it usually “clicks” from one stop to the next, meaning you can only adjust aperture by full stops. Sometimes this doesn't lend enough control for properly exposing the image, especially when considering the shutter speed shouldn't be adjusted when making video. 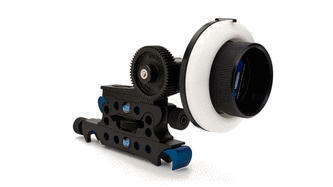 Most still lenses telescope – the barrel of the lens extends – when you zoom, problematic when using a matte box. Inconsequential if you don't use a matte box, and not a problem if you plan on setting your focal length before you shoot and don't plan to zoom. When you adjust focus on a still lens, the image appears to zoom slightly. This is called breathing, and can be very distracting to the trained eye and make other viewers think “something seems a little off.” Whether it's a major or minor annoyance, this can't be corrected. Achieve accurate focus before you shoot and don't make major adjustments while you're shooting. Most of these problems are not deal breakers for most consumers, but it's important to know the limitations of still lenses. Some problems, like telescoping and breathing, cannot be fixed; you just have to live with them. Adjustments can be made to lenses to make them more suitable for moving images, such as a Cine-Mod performed by Duclos Lenses. Duclos will de-click your iris ring so you can adjust your exposure without the constraint of full stops, add a gear to the focus ring for follow focus use and change the thread size of the front ring on the lens so you can use one neutral density filter for all your lenses, for example. Follow focus systems can make pulling focus a much easier process and allow you to achieve sharp focus even with the downfalls of still lenses. In some cases, special gears can be used to expand the focus throw on your lens as well. These units are usually expensive, but according to Philip Bloom, they don't always need to break your bank. If you have the money, you can buy a set of Zeiss compact primes, cinema lenses compatible with DSLR bodies. They're expensive, and not practical for most of us, but they do eliminate all the problems associated with still lenses. Another option is to buy old lenses without the autofocus option. These lenses are often of better build quality, and eliminate many of the focus problems presented by modern still lenses. More on this option in a later post. These downfalls may be discouraging. But remember, according to the author of DSLR Cinematography Guide, “you're getting a camera that has a shallower depth of field and is more sensitive to light than anything else south of $20k!” Also, a true cinema lens can cost you many times the cost of your camera, and you'll have a much smaller variety of lenses than if you take advantage of the vast array of DSLR lenses available. Many still lenses are extremely high quality, and all good lenses have similar basic principles. Read “Finding The Best Lens For The Job” (coming soon) to sift through the important aspects of a quality lens.